It’s that time of year! 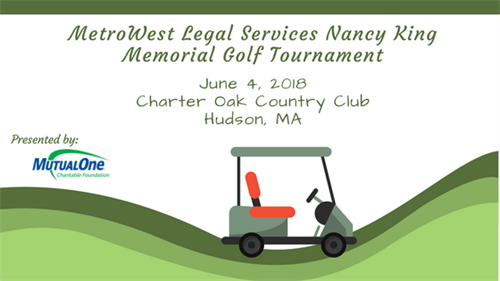 The 2018 MWLS Nancy King Memorial Golf Tournament will be held on Monday, June 4th, at the Charter Oak Country Club in Hudson, MA. The 18-hole tournament begins at 10:30 am with registration and lunch. The golfing begins at 12:30 pm with a shotgun start, and your choice of a scramble or best ball format. After a full day of golf, get ready to participate in some lively bidding at the cocktail hour, awards ceremony, and buffet dinner. Bring a friend to dinner and bid on one-of-a-kind silent auction items or test your luck in the raffle. You could take home a fabulous prize! This year we will also be presenting the Nancy King Award to Senator Karen Spilka. Since taking office in 2001, Senator Spilka has been dedicated to both supporting our mission and our clients. We applaud her success in expanding the Housing Court Statewide ensuring residents in MetroWest have access to a Housing Court and all of its specialized services. Click here for online registration and sponsorship payment. Interested in sponsoring the event? Click here to see our sponsorship opportunities. Sponsorship and individual golfer registration information can be found here.